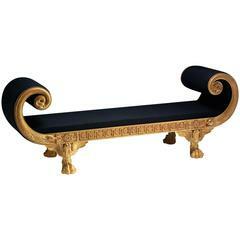 A daybed is the piece of furniture that every room needs, whether it knows it or not. Pita’s subtle lines in woodturned oak invite you to take a breath, close your eyes and halt the passage of time. Pita’s name comes from piteado, the traditional embroidery technique used on the cylindrical leather cushion whose pattern resembles falling rain. Rest your head on this cushion and the rain will wash away the weight of your day. Please note: This price includes the orange leather cushion embroidered by hand with pita (maguey fiber). For this independent design studio based in Guadalajara, Mexico, it's all in the details. Since 2007, Head designer and studio director Caterina Moretti has infused the brand with her unique ability to work with natural materials, explore texture and form, and bring nature indoors in surprising ways. Collaborations with local artisans and invited designers have contributed to the spirit of peca, resulting in a catalogue that is rich in both tradition and innovation. Peca welcomes requests from clients, and combines its work on design collections with custom projects that include furniture, accessories and interior design. 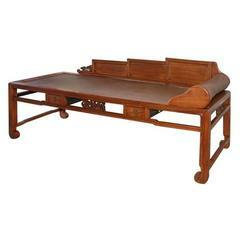 Late 19th century Q'ing dynasty ladies caned top daybed. Antique oak daybed Hand-carved and created to be placed against a wall Decorative front rail is ornately carved Sleigh bed style with carved eagles on top of side panels. 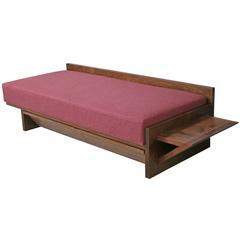 Padded daybed in patinated brown leather, buttoned, on wooden feet. Size of the bedding. H. 33, L. 200, B. 87 cm. Seating has some cracks.